There are no benefits for family, season pass or vouchers, until both OET & OEC are completed. Please refer to the overview below for further details. Outdoor Emergency Transportation (OET Class) Starting around the 2nd week of December, it is a 10-week program intended to adequately prepare skiers & snowboarders in the skills required to safely transport loaded and unloaded toboggans down all slopes, under any condition. Instruction is offered twice per week: Monday nights 6:15 – 10:25pm & Sunday mornings 8:15 – 11:30am. There is a practical final exam held in late February. Outdoor Emergency Care (OEC Class) is the first aid portion of the program and begins in September, just after Labor Day. The class meets on a weeknight from 7pm-10pm (the same night each week, typically Tuesdays) and every other Saturday from 8am-4pm. There is a written final exam and a practical final exam which are held in early December.Thank you for your interest in the National Ski Patrol Outdoor Emergency Class (OEC) sponsored by the Bear Creek Ski Patrol. We would like to tell you about the course and what our expectations are from you, and then let you know what you'll get in return. The course is designed to train you to provide first aid in an outdoor setting, possibly under harsh conditions, with limited initial access to equipment, but progressively adding equipment and resources. It's curriculum is based on the 1994 DOT EMS Response Curriculum. This is an intensive course consisting of both hands on and textbook work. You will be making a time commitment in terms of training, as will your instructors. It's important that you recognize the time commitment for both the OEC portion of the class and, if you choose to go on, the Outdoor Emergency Transport (OET) portion. We encourage you to have the support of your family and friends in this because of the time required. Classes will start promptly because there is much work to be done, so you will need to be on time. Approximately 50% of the class is lecture/discussion and 50% hands on practicum. You will be given the opportunity and training to become a team member in a nationally recognized organization. As a team member you will learn to be both a leader and a team player. You will get to meet and work with a diverse group of like-minded individuals who will encourage and support you in this endeavor. All of them will tell you that it wasn't easy, but it was worth the effort. 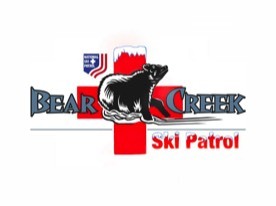 Upon passing of the OET and OEC training course, you will be a basic patroller and able to contribute to the Bear Creek Ski Patrol as an active member. As an active member, you will be required to take a weeknight shift and weekend shift. The weeknight shift is the same night each week and the weekend shift obligation is one shift every other weekend on a Saturday or Sunday.